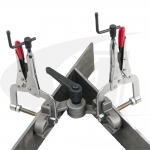 It’s been a while since a new product has come along that is really exciting to me and we’ve been fortunate to come across several lately: the amazing StrongHand Tools welding tables, and some equally amazing welding clamps. It used to be you had to cobble together all kinds of clamps to get your welding job set up, and it would take a lot of time–more time to set up than to weld! And as you know, without proper fit you’re not getting a good weld, and you may end up with heat distortion. We’ve recently added over 200 clamps and brackets–highly engineered welding tools to make proper fit and proper clamping a breeze, at a price you can afford. In the web store you’ll find high quality pictures so you can see how they work. This may seem like a pricey welding clamp, but it’s really 4 clamps in one. You’ll save on set up time and with the improved stability you’ll really Weld Like A PRO! This welding clamp is lightweight and compact, and the “Quick Acting Button” makes for quick and easy setup of your workpiece. The built-in magnets hold pipes, tubes, angle iron, or metal plates in position for fast, accurate clamping at 90º. 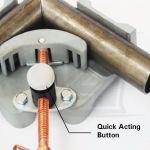 The JointMaster™ welding clamp adjusts from 30° – 275°. Set the angle and lock it in place with the handle. This welding clamp comes in two different sizes: 1-1/4″ (32 mm) or 3: (76 mm) for a variety of round and flat workpieces, or for welding materials of different thickness.